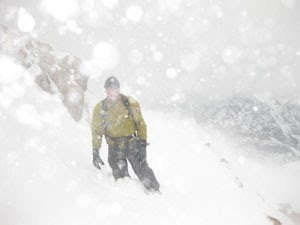 Mountain Weather: Will it be 8 or 9 Months of Winter? Will it be 8 or 9 Months of Winter? 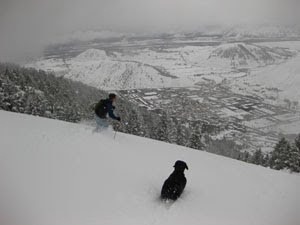 About the only question remaining for Jackson Hole is, when is winter going to quit? In the Tetons the first significant snowstorm of the year in the mountains happened on September 10, with about a foot of snow above the 9,000-ft. elevation. Here we are April 9th and we just finished a week (Monday thru Friday) that saw an additional 40 inches of snow fall above 9,000-ft.
that'll be 9 months of winter. SO, HOW BIG WAS THIS WINTER? Depending on how (and where) you measure your snowfall, the winter of 2010-2011 in Jackson Hole was big, and must be considered in the top three all-time, by almost any measure. As of this morning (April 9, 2011) there was 155 inches of settled snow at the base of Rendezvous Bowl at JHMR (that's almost 13 feet deep!). That matches the biggest year for settled snowpack depth on this date, set back in April 1997. (See Table below). As far as snowfall from October 1 thru April 8, the Winter's of 1996-97 and 2007-2008 both had more snow than this past winter. Numbers from last winter are thrown in for comparison also. We are darn close to that magical "600" inches of snowfall for the winter at JHMR. The Raymer Plot read 599 inches this morning. Same date in 2008, it stood at 609 inches. Why is 600 inches so "magical". Because that's 50-FEET of snowfall! The buzzword this winter was "La Nina", which began last fall and remained strong through January or February before it showed any signs of weakening. La Nina of course usually means more snow for the Pacific Northwest and Northern Rockies, and that played out in spades this winter. What's most unusual about this La Nina is, that it affected areas further south, like the Sierra's in California and the Wasatch in Utah, and even the central Colorado Rockies did O.K. and had well above normal snowfall winter's also. The La Nina is a little weaker now, although we are still feeling her impacts, and she is expected to continue to weaken into June, when we should get back to more normal climatic conditions. NOTE: That does not mean it is going to snow until June!